Royal Credit Union is expanding its already extensive Digital Signage network with additional branch and drive-up locations. It will be using StrandVision’s recently introduced R360 Linux digital media player to drive newdigital signage installations. RCU, a StrandVision customer since 2004, has StrandVision electronic signage in 15 of its lobbies and has integrated it directly into drive-up teller operations at eight locations in Minnesota and Wisconsin. It will add eight more lobbies and additional drive-ups in 2014. RCU’s lobby displays generally include a single 50” monitor per lobby and speakers that are placed to cover the waiting customer queue without disrupting staff or teller conversations. The lobby programming includes StrandVision-provided content like weather, plus personalized text and graphics pages, along with RCU’s televisions ads. The branch locations with drive-up teller services have a separate, non-audio StrandVision Digital Signage network to serve customers. The drive-up signage includes all of the same content except TV ads that require audio. 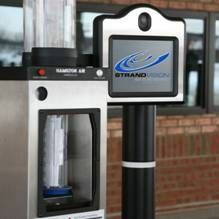 The signage is directly integrated into RCU’s Hamilton Air drive-up kiosks and is displayed on the drive-up’s teller communication monitor. The system screen shows the teller whenever he/she activates the audio/video channel, and displays the digital signage pages while the transaction is being completed and when the drive-up is idle between transactions. The new installations being rolled out in 2014 will be the first to take advantage of StrandVision’s new R360 Linux point-of-display digital media players. This upgrade will simplify installation and administration by eliminating Windows update issues and enabling closer integration with StrandVision’s cloud servers to virtually eliminate maintenance issues. During installation the StrandVision point-of-display digital media players automatically connect to a StrandVision digital signage host server in the cloud, log in using the preset username and password, initialize the connection and begin transmitting RCU’s digital signage content in seconds. During operation the StrandVision media player reduces bandwidth usage and improves stability by self-correcting most issues and automatically sending system performance updates and alerts to StrandVision and RCU’s digital signage system administrators. The Linux digital media players can also operate in standalone mode using cached digital signage content pages if there is a prolonged break in Internet communications.